We've seen random suffix raid items before, but they were usually limited to 2 stat suffixes to match standard raid items. It seems these are not so limited: I received a Thunderforged version of them with only 907 haste and no other secondary stat. 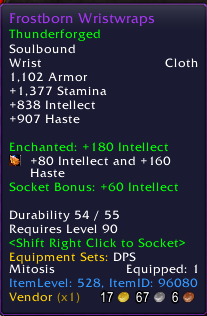 Got this item using a Mogu Rune of Fate on a Healing priest, and received an item with expertise, so the random enchant is truly random, and not based on your current spec.